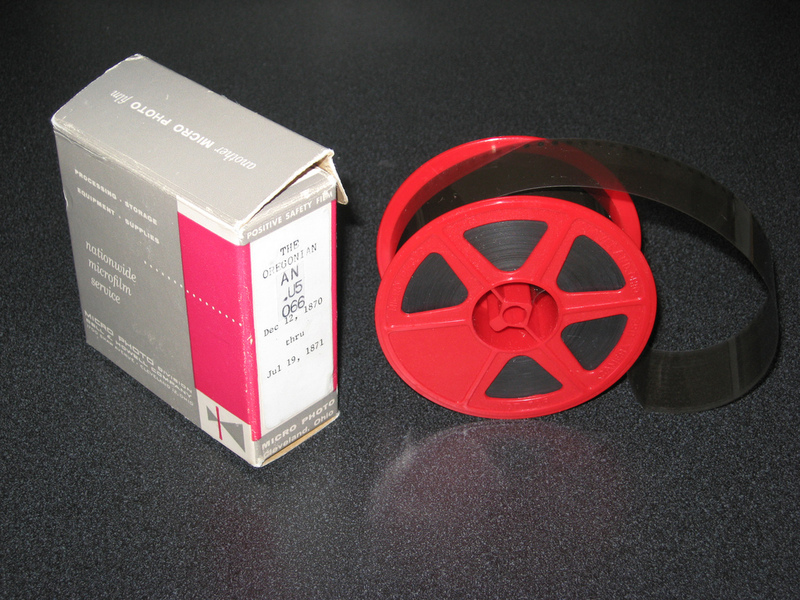 Though we are increasingly able to find digitized versions of microfilm which we can access from our favorite tech toys, there is much much more microfilm that we cannot access online. This will remain true for the foreseeable future. As mentioned in Wait a Minute, You Still use Microfilm? No, not all newspapers (please substitute any other kind of record here that you want to look at) are not all digitized these days. Every week I look at microfilmed newspaper records after exhausting what I can access online. The same is true for many other types of records which I can access on microfilm about 12 minutes from my house versus having to drive all over the state, region or country. And, microfilm is for the most part more enduring than the material it reproduces – paper. Paper likes to deteriorate and is susceptible to environmental conditions. Microfilm can also be easily copied. Microfilm can take the abuse of being constantly handled. Microfilm inherently has a long life span. Microfilm also has some advantages over digital media. To give you a bit more perspective on the pros and cons, read Film or Scan? which gives a nice comparison on the costs and other factors associated with choosing whether to microfilm a collection or digitize one. Even NARA, with all of its digitizing initiatives continues to preserve records on microfilm. So, don’t expect to be attending a memorial service for microfilm anytime soon. It is still one of a genealogists best friends and will remain such for a long time.